Okay so this morning I just finished a book and I totally do NOT know what to think about it. 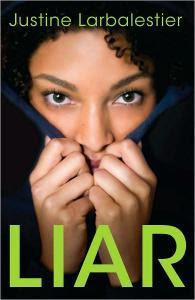 The novel is Justine Larbalestier's newest, Liar about a girl named Micah who is, basically, a total liar. She says so herself. Many, many times. And then she'll backtrack and tell you the actual truth about things later in the book--the truth about some of the lies she told that you didn't even know were lies. Sort of. Because then sometimes it's not the truth, what she tells you (after she admits she lied), but are instead other lies. Sometimes. And so Micha's sometimes-boyfriend Zach is dead. And, well, she's impliciated. Kind of. But she could be lying about that, too . . .
And it goes on and on up until the very end of the book. Really. Which is why, when the twist comes--and, yes, there is a really big twist--I have to admit I was a little disappointed. Because then the story follows along those threads, and even though you're like "Well wait she could be lying about all this too," the way Larbalestier writes the story (and how much time the rest of that twist-plot takes in the book), it kinda pretty much doesn't seem like Micah's lying about it. It kinda seems like she's telling the truth. So I totally don't know what to think. And the author isn't any help either because she says on her website: "I deliberately wrote the book to be read in at least two different ways. You may think you know what kind of book it is and what kind of person Micah is, but you'll find other readers disagree completely. There is no one right way to read this book." Which is why, I guess, you should read it (though I'm not sure I'm recommending it, because I don't know what to think). But at least then I'll have someone to talk to about it. Someone who can help me (maybe) see the truth about this book.